We had two girls in two years. My husband and I planned on four kids. But I had complications after the birth of No. 2 in 2015. A year and a half later, I still wasn’t well. 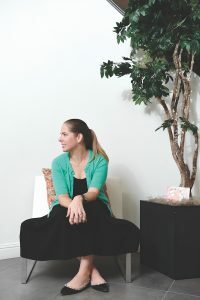 I’d studied to be a physician’s assistant before I got married, so when an exam showed a lot of ovarian cysts, my background and my intuition told me there might be something else going on. I got a genetic test done at Hoag Hospital. The test showed that I had a 95 percent probability of getting ovarian cancer due to a mutation in the BRCA2 gene. It also showed a high risk of breast cancer. My family has a huge incidence of cancer— my mom got ovarian cancer after I was born, a 40-year-old cousin has stage 4 colon cancer, many aunts have had cancer. Ovarian cancer is very hard to predict and often a death sentence. Survival rates are low. Often, by the time you know it, it’s too late—it’s spread, and you have five years to live. We were lucky to know early. I’d wanted to try for a third child, but when the doctors said I had a 75 percent chance of a miscarriage due to my previous uterine damage, the risk seemed too great. My husband initially thought I had plenty of time. But once he got educated on genetic testing and how accurate it is, he called the decision a “no-brainer.” We want to grow old together and live a long life with the two healthy, beautiful, active kids we have. Given all that, I decided on a full hysterectomy at 35. I haven’t met anyone who has done it this young. It’s a complete mind shift to be proactive. I didn’t technically have cancer yet, but the preventive act was necessary for longevity. The hardest part is going through menopause now, 10 years early. I’ll wait until 40 to make the next step on breast surgery. Breasts are lower risks. I’ll keep monitoring them for an eventual full mastectomy. I’d forgotten about Angelina Jolie until I got the BRCA2 mutation diagnosis. But when people hear about my positive screening, they say, “Oh, you got the Angelina gene.” So she did raise public awareness. I’m very big now on telling young women to get checked. When I talk to people my age, they say, “I don’t want to do that test. I don’t want to know. I’d rather just be blindsided.” That’s scary. I wonder if I want my daughters to get tested at 21. Will it put the fear in them? By that time, I hope it’ll be standard screening. It’ll give them an option to make decisions. It hits home that I won’t have more kids when my daughters ask me, “When will you have a baby brother for us?” “Maybe we will,” I say, “if we adopt.” My husband and I are open to it. Even now, my grandma still hassles me. “You should’ve waited to have one more child,” she’ll say, or “Why did you rush?” or “Why did you do the screening at such a young age?” To her generation, ignorance is bliss.